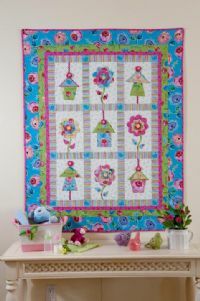 Whimsical birdhouses hang and flowers bloom in this easy applique quilt. A nice accent for any nursery or young childs room. This quilt is featured in the June/July 2012 issue of Quilt Magazine. The kit includes fabric to make the quilt but does not include the buttons or rick rack. Pattern is available in the magazine only. The quilt measures 46" x 58"
Shipping fee is included in the cost of the kit.